Home > Our Blogs > Facing Today > How Can Understanding History Nurture Civic Participation? "I was confused as to why upstander wasn't a word that was listed in the dictionary," says New York University freshman Monica Mahal, who along with her high school friend Sarah Decker, a Bucknell University freshman, is working to raise awareness about the word and its meaning. "I looked up the new words that were added to the dictionary last year, and it irked me," says Mahal, who attended Watchung Hills Regional High School in New Jersey. "Those are words that are commonly used, yes, but if you look at what society should focus on, the values we should work to create, that wasn't reflected in choices like twerk and selfie. We decided to take action." Upstander is a term frequently used in Facing History resources and classrooms to describe people that take action on behalf of others—the opposite of the more commonly-used bystander (which is included in the dictionary). "We define it as a person who chooses to take positive action in the face of injustice in society or in situations where individuals need assistance," Mahal says. The OED adds newly popular words to its pages throughout the year. So how do you go about getting a word added? "That's a good question," Mahal says. "There's no simple way, but there are two steps you can take—one is to create awareness and the other is to prove that the word has been published and is used in sources." So in January, Mahal and Decker created a Change.org petition that invites people to support the movement and add their name to a letter addressed to the Oxford English Dictionary. To date, nearly 540 people—from countries including Germany, China, Canada, and states from California to Connecticut—have signed on. "It makes me really happy to see that this idea of standing up for what's right, it's so simple it resonates with people from different cultures and countries, who speak different languages," Mahal says. "Our ultimate goal is to get the word included in the dictionary—to one day be typing at the computer and not have upstander underlined in red," says Decker, who also interned with Facing History in New York. "But the result of the effort meets another goal as well—just educating people around the world about what this concept means. Education is the first step to positive action." "The concept of upstander was so ingrained throughout our high school experience," Decker continues. "It helped students look at what was happening in the cafeteria, in the hallways, the locker rooms all in a different way. It is a word that really did change the environment of our high school." "It never struck us that it wasn't a common word," Mahal agrees. 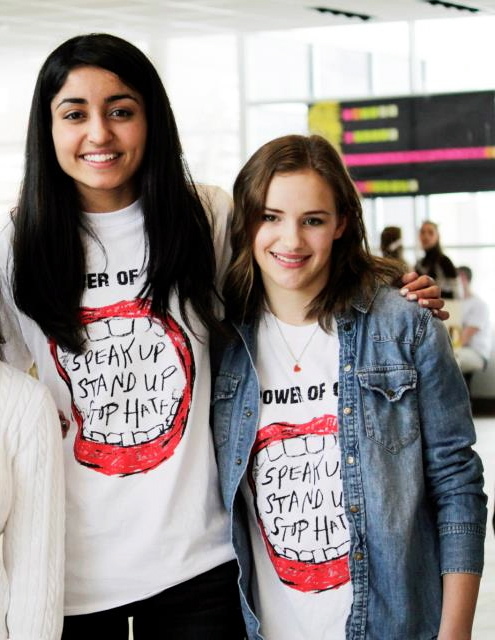 Both girls served on their high school’s diversity council and in their senior year, organized a community "White-Out to Erase Bullying" event, which raised awareness of bullying, of upstander behavior, and encouraged students to pledge not to be silent in the face of bullying at their own schools. Even the town’s mayor and city council members joined in. "It's sending out a bad message to youth when the word bystander is in the dictionary, but upstander isn't," Decker says. "It's such an important concept and we believe it needs to be defined and universally shared." Do you want to see the word upstander added to the OED? Take a minute and sign the petition. How can history nurture civic participation? Watch the livestream of our third annual Day of Learning tomorrow and join us on Twitter at #LearnFH2015.